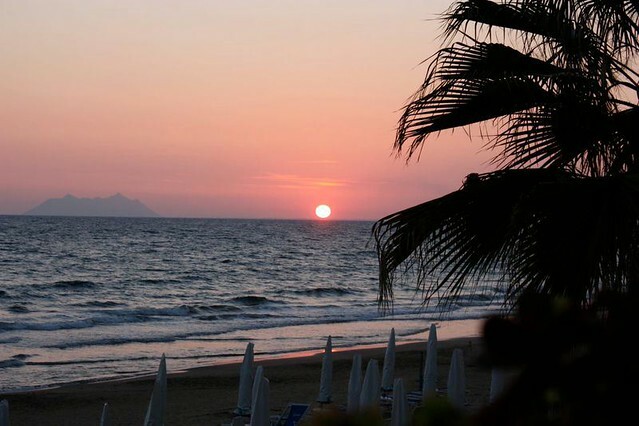 Sperlonga Italy: the best family beach holiday in Italy? Italy has over 7000 km of beautiful coast, extending from the shores of the Northern Mediterranean to the warmer waters of the Ionian sea, in Sicily. It is a perfect destination if you are looking for a European beach holiday but can be tricky for families with children: Italy’s coastline is not always sandy and often only accessible through steep steps. 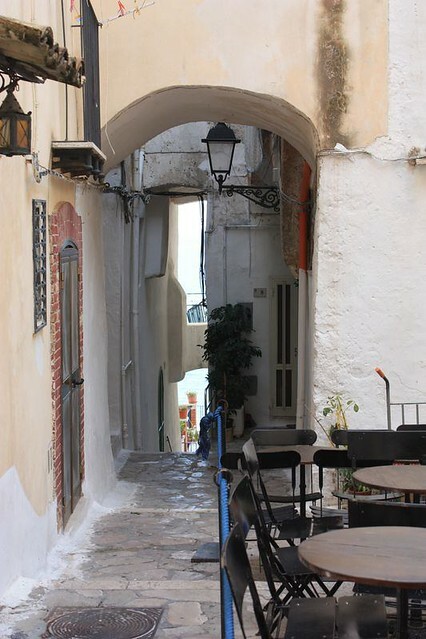 A place that seems to be designed for families, in terms of safety, beauty and ease of access is Sperlonga, a whitewashed, charming village on the Tyrrhenian coast, about midway between Rome and Naples. Practical info: Sperlonga Italy can be reached by car in a little over 1 hour from Rome or with a combination of train + bus. The official website for rail travel in Italy is Trenitalia and the bus for this area is this one. If travelling with children, you might find useful my post about train travel in Italy with kids, full of practical tips and advice. 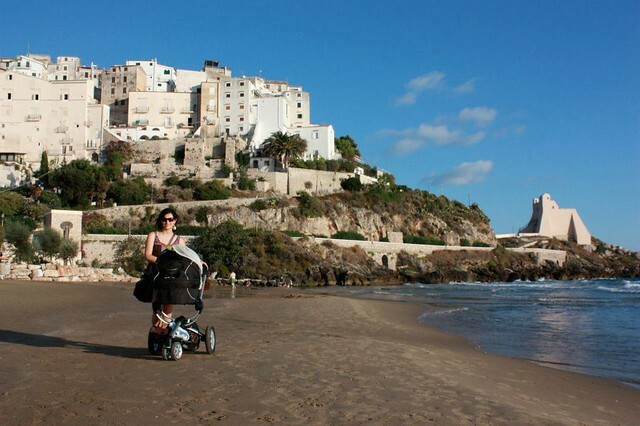 Sperlonga with children: me and my son, only 2 months old on our first ever family vacation! 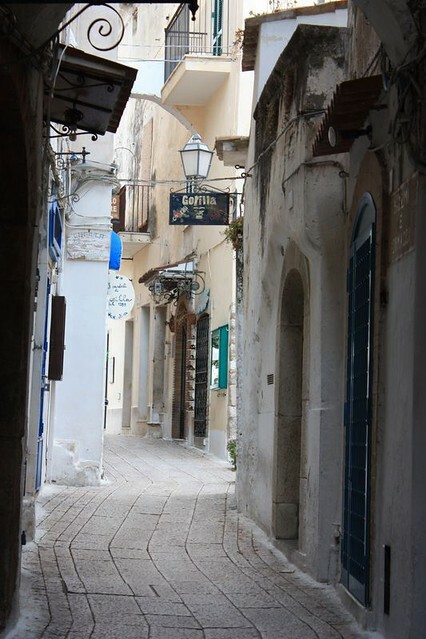 Sperlonga is a place I have known since I was a child. My parents have always been keen travellers and their approach to discovering the world was very simple: get the car, pack a tent and just go. This philosophy often brought us to drive across Europe but we never neglected Italy and Sperlonga stayed for a long time one of our favourite spots. I remember that we used to go camping there (there is no shortage of campsites) and I absolutely loved it: staying in a tent was great fun and the beach was paradise as the water was clear and shallow, safe even for a child like me, not very keen on swimming. 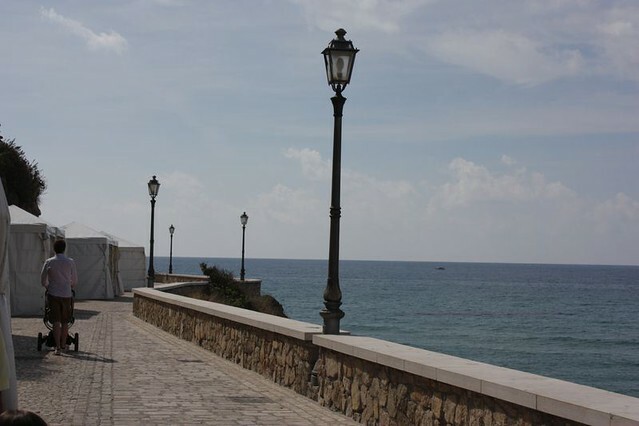 I decided to go back to Sperlonga only a few years ago, when my son was a couple of months old. I had planned that holiday on the basis of childhood memories and I was aware that I might find Sperlonga very different from how I remembered it. But when I got there, my fears evaporated: the beach and the sea were exactly how I remembered them and the village perched on the hill, more charming than ever. Sperlonga beach is clean, soft, sandy and it stretches for miles. The water here is shallow and clean and it is perfect for families with kids. Wandering into the Mediterranean here is safe: the water in only few inches deep until pretty far out and this means that even tiny tots can play on the shore without fear of sudden waves or sudden drops. The beach here is mostly occupied by hotels and ‘stabilimenti’ so if you want to get a nice spot it is advisable to book chairs and umbrellas in advance. The cost varies and may get steep in high season: the best deals are usually with hotels, which often have private beach access (see our hotel pick below). A word of warning: in summer, Sperlonga has very many moquitoes and they are a real pain. While not dangerous (they do not carry diseases) they are very annoying and especially on little children or sensitive skins may cause an unpleasant swelling. Before heading to the beach for an evening walk, do use insect repellent – you can find them (both chemical and natural, for adults and kids) in the local pharmacy. We went to Sperlonga at the beginning of September and we were welcomed by beautiful blue sky and mild temperatures. Unlike my camping-loving parents, we used the excuse of the baby to treat ourselves to a hotel and we checked in at the Hotel Aurora, just on the seafront, at the foot of the village. The hotel Aurora was amazing: the rooms were clean and perfectly equipped, the staff super friendly and the location excellent, just on the beach, close to shops and restaurants and at the bottom of the steps climbing up the hill (which meant we never had to go up the steps unless we wanted to!). We spent a probably excessive amount of time on their terrace, sipping aperitivo in front of the sea (a well-deserved break if you have a two-month-old baby and also if you don’t). When we weren’t sipping soft drinks (or rocking the baby to sleep) we spent out days exploring the village. 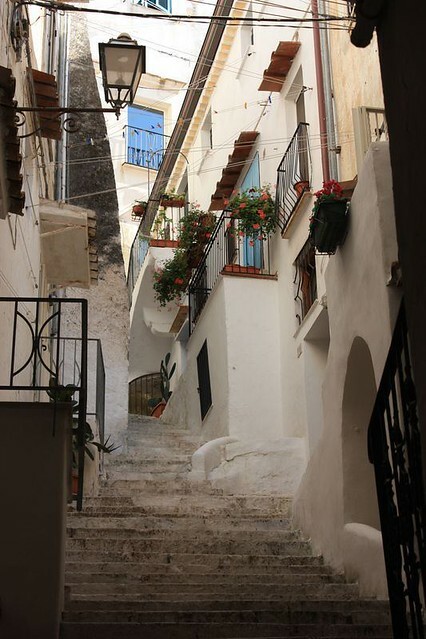 The oldest part of Sperlonga is on the top of a hill and the most scenic way to reach it from the beach is through the little winding road and stairs that climb up to it. The trek is tiring -and impossible with a pram (you can take the road in that case) – but it’s really worth it. If you don’t feel like taking the stairs, as we often didn’t, you can opt for an easier walk along the waterfront. This is also where often, in the summer, you have events and festivals, usually based on either showcasing local food product or art. 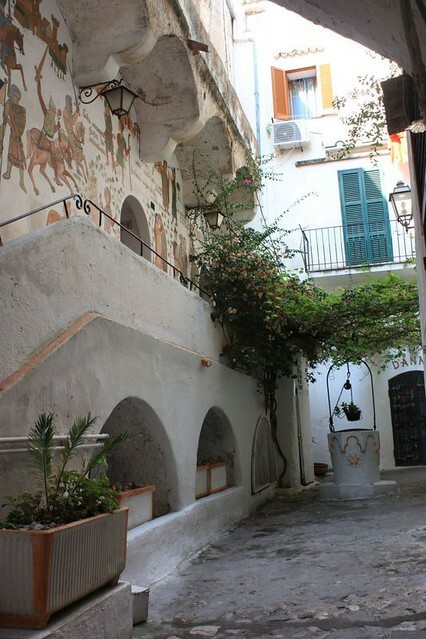 Sperlonga is pleasant and beautiful but it’s a base, more than a place with attractions as such. One of the many interesting sites in the area is Tiberius’ s palace. I actually didn’t think of this until I went there (shame on me, a classics graduate! 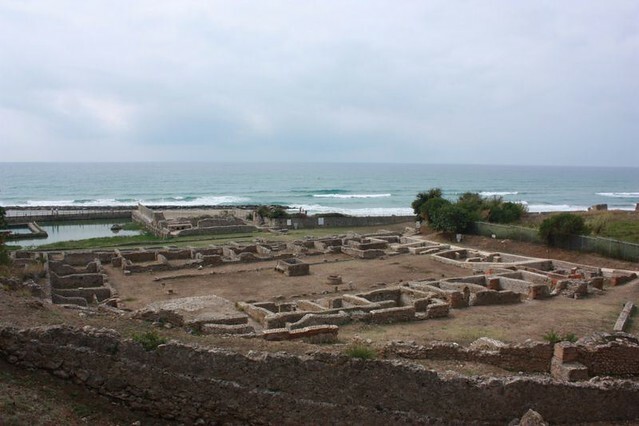 ), but Sperlonga was actually one of Emperor Tiberius’ favourite places, along with Capri, and the remains of his palace can still now be visited. We went there one morning and found the site really impressive. If you go there make sure you walk down the rocky path to the main archaeological site and also check out the museum and the impressive sculptures of Polyphemus, Scylla, Odysseus and Ganymedes which are truly a sight to behold. I recommend you bring a guidebook with you as I found the info provided on the main site were scarce. Sperlonga is also great if you want to go to the Isole Pontine, as ferries depart from towns such as Terracina and Anzio, a short drive away from the village. Isole Pontine are amazing and definitely worth a visit (or better: try spend there a few days) and we are very much hoping to go there this time around. This post contains affiliate links and if you click on them I will get a small commission at no extra cost to you. This small amount will help me cover the cost of running this blog and keep bringing you interesting content. Thank you!